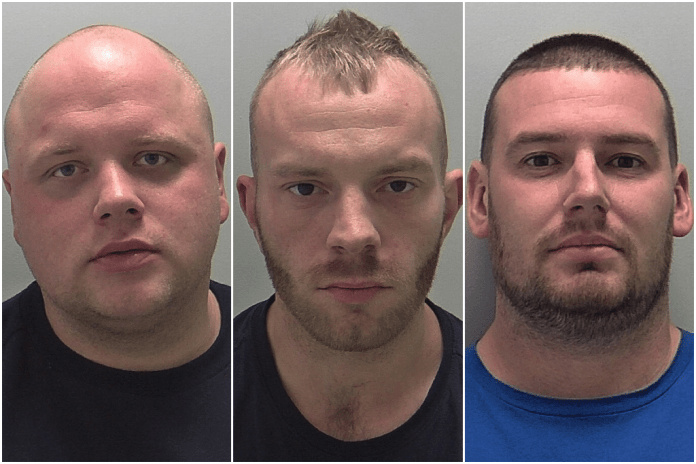 A joint investigation between Warwickshire Police and West Midlands Police into a series of car key burglaries across three counties has seen three South Birmingham men jailed by Warwickshire Crown Court. Two men were jailed for a total of 12 offences, in Warwickshire, Worcestershire and the West Midlands, over a three week period in August and September this year, in which a number of high value vehicles – including Audis and BMWs – were stolen. 29 year old Nathan Lumbard (pictured left) from Kings Norton was initially linked to a car seen acting suspiciously in Henley-in-Arden in August. Tracking data from the car – which had been hired by Lumbard – linked him to several burglaries and attempted burglaries. Further investigation by officers led them to link 28 year old Robert Craig Wood (pictured centre), from Selly Oak, to the offences. Police raided a business address in Lumbard’s name at Weights Lane Business Park in Redditch on 10th September. Car parts – including some from one of the stolen cars – and a shotgun stolen from a burglary in Henley-in-Arden were recovered. Wood was arrested at his home the same day and Lumbard was arrested on 17 September. The pair were placed at the scene of burglaries and attempted burglaries around Stratford, Droitwich and Solihull by the hire car’s tracking data, their mobile phones and road cameras. Both Lumbard and Wood were jailed for four years and eight months by Warwickshire Crown Court on Friday 9th November after pleading guilty to conspiracy to commit burglary and conspiracy to steal a motor vehicle. Wood admitted involvement in all 12 offences and Lumbard admitted involvement of 10 of them. A Kings Heath man was also arrested as part of the investigation and sentenced at Warwickshire Crown Court last month. John O’Shaughnessy, 31, (pictured right) was jailed for fie years after pleading guilty to possession of the shotgun seized during the Redditch raid and handling stolen goods. They’ll be out in 2, 3 years at the most. No doubt they will continue with their high risk but profitable occupation because they simply don’t care.